END OF THE ROAD PROPERTY, POWER CLOSE, VIEWS! 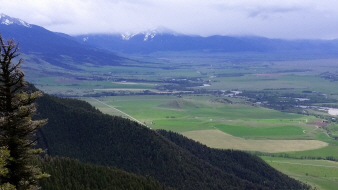 On top of the world views of the Yellowstone River Valley. This tree covered property is at the end of the road, less than a mile from the Yellowstone River, but 1800 vertical feet above it!! At 6400 feet in elevation, this is just seasonal access or else you will need a snowmobile or skiis! As the crow flies, just 5 miles south of Livingston (pop 9000), but 12 miles by road and 45 minutes of travel time. Power is just across the access road from this property even though it is remote. Owner financing is available with 20% or more down. Broker owned. Lots of trees on this south facing sloped 23 acres. It borders about 300 acres of public land to the west and has great views of the Paradise Valley to the south and Emigrant Peak. You can see the Yellowstone River, though the hike down to it is not for the faint of heart! This is steep property, but there are several bench areas that you could build a small cabin on or if you did some excavating you could build a larger home. Plenty of trees; maybe some marketable timber on the property. Lots of wildlife here including deer, elk, moose, bear, grouse and mountain lions. Only about 2 miles from the National Forest access for the Absaroka-Beartooth Wilderness area. This property is in a subdivision of 20 plus acre properties behind a locked gate. The subdivision has a number of summer cabins and homes. There is a developed spring for use by the residents who haul water from it to their cabins. Access requires a 4x4 or at least a high clearance vehicle when the roads are dry.